Ever since the beginning of Hollywood, the actual location or state of mind, Hollywood has enjoyed giving us an insider's view of itself. Sometimes heartbreaking as in the various versions of A Star is Born. Sometimes in the vein of an expose as in 1957s Four Girls in Town or 1952s The Bad and the Beautiful. The nostalgia of 1952s Singin' in the Rain or 2011s The Artist has proven a winning approach for filmmakers and audiences. The dark humour behind 1950s Sunset Boulevard is truly classic. Most often, Hollywood likes to poke fun at itself as in 1928s Show People, 1932s Make Me a Star and 1938s Boy Meets Girl. The 1937 feature Stand-In is based on a Saturday Evening Post story by Clarence Budington Kelland, a writer who gave us many familiar movies including Speak Easily with Buster Keaton, The Cat's Paw with Harold Lloyd, Strike Me Pink with Eddie Cantor, Mr. 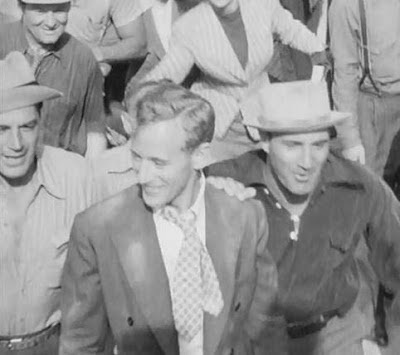 Deeds Goes to Town with Gary Cooper, Arizona with Jean Arthur and Sugarfoot with Randolph Scott. The director is Tay Garnett of The Postman Always Rings Twice, The Valley of Decision, Bataan, A Connecticut Yankee in King Arthur's Court and Cause for Alarm!. Stand-In is equal parts goofy and adorable, and a wonderful showcase for its leading players perpetually popular Joan Blondell and TCM Star of the Month for July, Leslie Howard. Howard plays Atterbury Dodd, a man dedicated to the beauty and logic found in science. Dodd is convinced that it is illogical for his banking employers to sell Colossal Studios because he knows he can turn the studio around and make a profit for the shareholders. 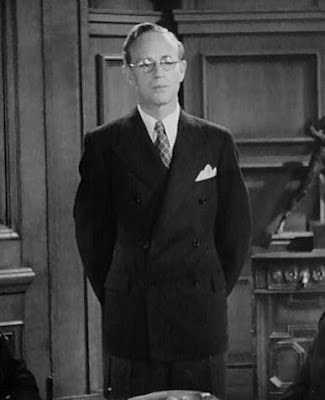 The ancient head of the bank played by Tully Marshall is equally convinced that Dodd is wrong in his assumption because he is not taking the human factor into account. Hollywood is run by people and most of the people are crazy. The rambunctious senior citizen sends Atterbury Dodd to Hollywood with complete power over the studio where he is sure to learn a thing or two. Atterbury Dodd goes to Hollywood but does not "go Hollywood" much to the dismay of an overbearingly obnoxious studio PR man played by Jack Carson (The Strawberry Blonde, Cat on a Hot Tin Roof). Studio executive C. Henry Gordon (The Charge of the Light Brigade, Charlie Chan at the Olympics) is the mastermind behind a plan to unload Colossal at a profit to himself and the demise of the studio. Collaborating on this bit of corporate sabotage is the public relations man, an over-the-top Russian director played by Alan Mowbray (My Darling Clementine, I Wake Up Screaming) and a cigarette girl now quickly fading movie queen played by beauty pageant contestant turned actress Marla Shelton. They plan to keep Atterbury Dodd occupied with glitz and glamour and away from the company books. Unfortunately for the crooks, Dodd is not only a man totally dedicated to his career, but he also has no interest in nightlife and has never even heard of Shirley Temple or Clark Gable. He is also increasingly frustrated when each example of stupidity and excess is explained away with "That's the picture business." 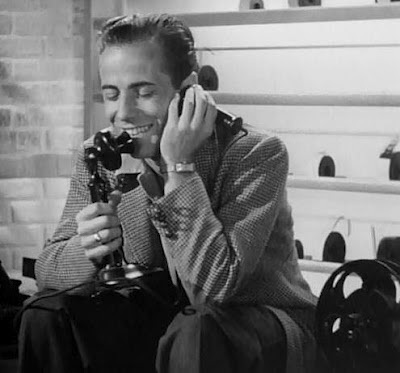 How often do we see Bogie this relaxed on screen? Luckily for Dodd, there is one person of integrity he can turn to on the studio lot in producer Douglas Quintain played by Humphrey Bogart. Currently, Quintain's integrity is slightly compromised by his undying love for the glamour puss who has aligned herself with the crooks to revive her fading career, but his heart is in the right place if booze doesn't get in the way. Miss Plum pulls out all the stops! More good fortune comes into Atterbury Dodd's life his first day in Hollywood when he is befriended by Miss Lester Plum played by Joan Blondell. Miss Plum is a former child star who is currently employed as a stand-in for the aforementioned glamour puss. She also is the graduate of a night school secretarial course and has a more than motherly interest in fish-out-of-water Atterbury Dodd. Miss Plum certainly has her work cut out for her in cluing Dodd into the intricacies of the picture business and romance. How can a guy be so smart about some things and so dumb about others? The big lug! Will Atterbury Dodd ever come to his senses, save the day and win the girl? The ending of Stand-In, like the rest of the movie, is equal parts goofy and adorable. 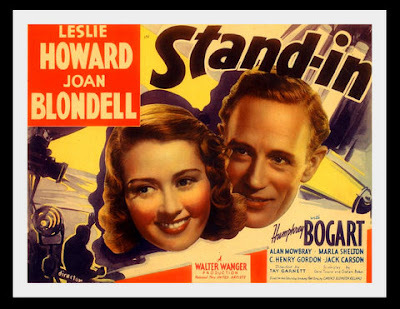 TCM is airing Stand-In Tuesday, July 3rd at 12:00 a.m. as part of the first evening of the month-long salute to Leslie Howard. It is a charming little diversion after the prime-time screening of the emotionally charged Gone With the Wind. Bonus: If you are one who scours classic films for a sight of Esther Howard, Olin Howland, and Pat Flaherty then this is the movie for you! Thanks for the heads up. I love that movie and haven't seen it in a few years. Don't you just love a "little" movie that may have been under the radar for decades? Thanks, MissMcC. I think a fun flick is always worthwhile. Also, Leslie Howard as Star of the Month will give us lots of treats from TCM. Sounds like a winner. Esther Howard? By golly, sign me up. Great background, thanks. TCM should sign you up. JTL, we should have stamp books that we can fill up when we spot our favourite character folks. The one who has the most stamps wins! Maybe not a lot of money or even a lot of glory, but nonetheless we'll be winners. But I don't even think my Pat Flaherty counts as a character actor. He's basically an uncredited extra who may get a line now and again. Do I still get to play your game? Of course you can still play the game, Miss McC. Pat has lots of lines (you know, for Pat) in "Stand-In". Love this film! For once, Joan Blondell - after being so much better than most of the Warners stuff she was given - got a good role and she is, well, just a plum! And I love Leslie Howard in comedy. In fact, if he had been allowed to play Gone With the Wind as a comedy, I am sure I would have enjoyed his performance as Ashley so much more! Hooray! Somehow I knew FlickChick was a fan. Comedy really is Howard's forte. Love him as Henry Higgins, and the drollery he brings to "The Scarlet Pimpernel" makes that a winner. Any, film with Joan Blondell.. count me in..
Joanie's a winner. A few years back during "Summer Under the Stars" TCM Canada didn't have a William Powell day, but we didn't complain because they gave us Joan Blondell day. You got me on this one, C.W. I've never even heard of this movie. Bogart smiling? What is the world coming to? This movie sounds like a total hoot. Great review! It's a fun flick, Yvette. The leads do not disappoint.